Written by Catherine Saxelby on Wednesday, 06 February 2019. Legumes are one of our best friends. Also known as pulses or beans, they are nutritious, versatile and budget-friendly. It’s definitely worth getting to know how to cook them if you’re vegetarian—they should be a staple protein source, and for the meat eater, they extend the protein of meat or chicken. For instance, if you add a can of kidney beans to a mince recipe or casserole, you save on cost and still have a delicious and nutritious high-protein dinner. Legumes are the dried edible seeds of the plants from the Leguminosae family. The green beans and peas we enjoy as vegetables with our meals belong to the same botanic family but they are nutritionally different because their water content is so much higher and that changes their nutrient levels. They are also younger. 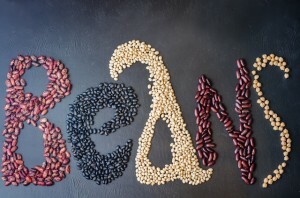 Legumes include chickpeas, beans (includes butter beans, haricot (navy) beans, cannellini beans, red kidney beans, adzuki beans, black-eyed beans and soybeans), peas, lentils, and lupins. How do legumes rate for nutrition? Beans, lentils and split peas have almost no fat (apart from soy beans) and are packed with fibre, protein, B vitamins and minerals, and heart-friendly phytonutrients. All have a similar composition except for soy beans, which contain a higher amount of quality protein and oil. All legumes boast one of the lowest levels of Glycemic Index (GI) of any starchy food, meaning they are digested and absorbed slowly, so fill you up and keep hunger away. If you can swap some of your potatoes or rice for beans (or mix in half and half), you’ll reduce the overall GI of your diet because your body digests them slowly. This is primarily because their starch breaks down relatively slowly (or incompletely) during cooking and they contain enzyme-inhibitors that also slow digestion. All legumes or pulses are gluten-free. You’ll see below that all lentils, peas and beans are low in GI and worth including in your daily diet. All figures are for 100 grams soaked then boiled or canned weight with the GI being relative to glucose set at 100. Source: Atkinson FS, Foster-Powell K, Brand-Miller JC. International Tables of Glycemic Index and Glycemic Load Values: 2008. Diab Care 2008; 31(12). A few years ago, researchers were hopeful that legumes, particularly soy beans, could alleviate menopausal symptoms (because of the phytoestrogens or plant hormones they contain), but later research has shown their benefits are mild, if they occur at all. More certain is the fact that a healthy diet containing a wide variety of foods (including soy and legumes) is ideal at this stage of life. a small 100 g can of baked beans. See these details at www.eatforhealth.gov.au. Don’t feel guilty about using canned! The process of soaking and cooking beans often deters people, but canned beans such as canned chick peas or canned black-eyed beans make a convenient and nutritious alternative. They are mostly equivalent to home-cooked beans, there is some loss of B vitamins during canning but it is not significant. The protein, fibre and minerals remain unchanged. The only disadvantage with canned beans is that they tend to be softer in texture. If you like a firmer texture, you’ll probably need to cook your own. Baked beans are the most popular of canned beans, either as a snack or as a light meal, and are generally made from haricot beans cooked in a tomato sauce. Their high fibre content—at around 6 grams of fibre, a small 100 gram can of beans has as much fibre as three slices of grainy bread or a bowl of bran flakes. Their indigestible sugars called raffinose, stachyose and verbascose that reach the large bowel intact where they are fermented by the resident bacteria. Believe it or not, this is good for colonic health, increasing the proportion of good bifido bacteria and reducing potential pathogens. But it produces unpleasant odours! What can you do about the wind? Not all legumes will make you windy, and not everyone has the problem to the same extent. If you’re concerned, opt for the smaller types of legumes such as lentils and smaller sized beans such as navy or haricot beans. And cook them well. Cooking legumes in fresh water (not the water you soaked them in) reduces the chances of wind, as does eating small amounts regularly—your body becomes used to them. Canned beans don’t seem to be as lethal as dried and cooked ones either. Canned types have been heated during processing which seems to help. Still drain off any of the surrounding briny liquid and rinse twice before using. Another remedy is to add a pinch of the spice asafoetida to the pot during cooking—no more than a quarter of a teaspoon of the powder per cup of dried beans or lentils. Note: Most legumes are high FODMAP so if you’re on a low FODMAP diet then they’re probably not for you.